All donations welcome. For a donation of less than $50, please send a check made out to The Boston Foundation, and please write "Linda Friedman Memorial Fund" in the memo line. Mail to The Boston Foundation/Attn: Dan Sherman/75 Arlington St., 3 Floor/ Boston, MA 02116. To donate by credit card above $50, please click on the Donate button. Our sister Linda was beautiful, vivacious and charismatic. She loved being alive. She was very loving toward her immediate and extended families and beloved by friends and teachers. Tragically, she died of kidney failure in 1961 just before her fifteenth birthday - as she was coming of age and gaining awareness of herself. Our parents, Abe and Charlotte, were understandably destroyed and devastated. David, the eldest brother, was 17 years old when Linda died, and Larry (now Lev), was 10. Both of us were traumatized. In 1961 there was little if any support for grieving families as there is today. There were many tears, and grieving came easily, but finding peace with grief was impossible. Linda’s pictures came down. Slowly but surely all evidence of her life was removed from the living space in our house, given away or stored in the attic. We, David and Lev, learned how to comfort our mother, give space to our father and never turn the conversation to Linda. The silence of her absence was deafening. No thought was given to comforting us, the surviving siblings. We learned to suppress the pain of this tremendous loss. After consulting their rabbi, our parents took his advice and had another child. Roger was born, just one year after Linda’s death, into our family's secret grief. Hard as it may be to imagine now, our parents did not tell Roger about their daughter and did not want Lev or David to do so either. It wasn’t until he was 10 years old that Roger found a box of get well cards and letters in a dusty box in the attic in our Long Island home. That is how he discovered the sister he never knew. Our parents found it too hard to talk about her and asked our Aunt Selma to tell Roger about Linda’s life. Because our parents could not talk about her, the silence descended once again and we all lived with Linda's ghost, instead of her radiant living memory. If you did not know our past, you would never have known that tragedy was one of the underpinnings of our family culture. As you can imagine, the silent grief, and keeping the family secret from Roger those first 10 years, affected each of our psyches dramatically. Regardless of the dysfunction, we all went on to live highly functional lives. In adulthood all of us brothers made attempts to resurrect Linda’s memory within the family. This was met with some acceptance by our parents but the taboo that existed was so strong that it was next to impossible for any of us to overcome it. When our mother was in her 80’s Roger asked her why she couldn’t talk about Linda and in so doing move the grief to a more manageable place. She replied that she was afraid once she started crying she would never be able to stop. When Roger came down the stairs from our attic in 1972, having just discovered evidence of the sister he never knew, he asked a simple question: "Who is Linda Friedman?" In our own way, this project is an attempt to answer that most profound of simple questions. Fifty-six years after Linda died, with the gentle prodding of the next generation, we and our spouses and children are ready to bring Linda back into our family and fulfill the mitzvah of Kavod haMeit, honoring the dead. It is high time for Linda’s memory to be honored. Therefore, we are establishing the Linda Friedman Memorial Award. We welcome donations in Linda's memory to help us establish the fund to support the award. Linda loved Judaism, and had a strong connection with God. While we can't know for sure what her thoughts would have been about the current crises facing our world, we intuit that her childhood compassion for others would have translated into an adult passion for justice. In her name, we will honor those working for justice with and through the Jewish community. Each year, for as long as the fund lasts, one 3rd or 4th year Hebrew College rabbinical student will be awarded The Linda Friedman Memorial Award in honor of social justice work they have recently completed or in which they are taking ongoing leadership. The award is $1000 per year, paid directly to the recipient, and the recipient and their work will be featured in the Hebrew College Ordination program. We are especially interested in awarding work that a). has an impact on a social justice issue, such as healthcare, immigration, food access, climate change, animal welfare, poverty, etc. and b). positively transforms the participants’ spiritual lives and relationship to Judaism. Our goal is $20,000 but we hope to raise more to be able to endow the fund. Hebrew College faculty and students are encouraged to nominate 3rd and 4th year students for the award. Details on the nomination process will be forthcoming. Each year, on or near Linda's yahrzeit (28 Shevat, which falls around February on the Gregorian calendar), one of her family members will visit the Hebrew College Beit Midrash (House of Study, where students learn together) to speak briefly about Linda and dedicate the day's learning to her memory. 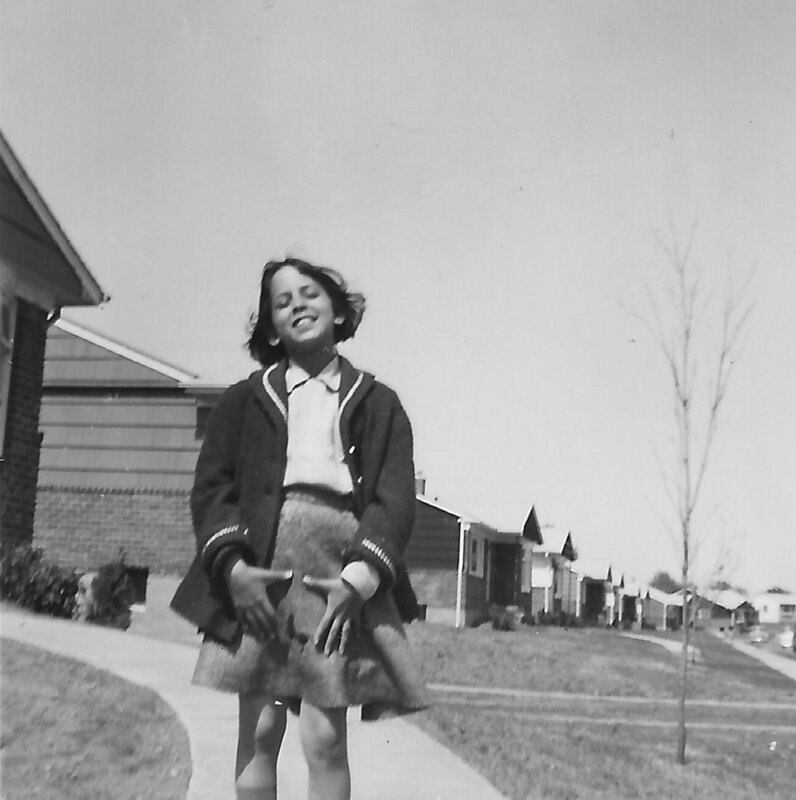 We invite you to take a moment to look through this slideshow of Linda's life and family. Since her photos were hidden for so long, each of you who see her face and witness her spirit help to honor her memory and bring her into the light. Linda, ca. 1948, two years old. in front of our grandparents' apartment building in The Bronx, ca. 1948. Is that David in the background? Ca. 1955, visit to a park. The photographer, 10 years old. ca. 1955-56. Note the suburban post-war development in the background. All dressed up and going to a party, 1957. Some of our extended family on Mom's side in Miami. 12 year old Larry holding baby brother Roger (front right). Mom is standing right behind us. Roger gets his start on guitar. He's now a successful musician! in the den in Westbury, with Bigi the cat. Dedication in Linda's high school yearbook, the Jericho Imperator. 1963, the year she would have graduated.